With apologies to Trekkies everywhere, today's post is about up and coming jockeys. It's a two parter. In the first part, I'll tell you about five jockeys on whom I have a very close eye; and in part two, I'll outline how you might do some similar legwork for yourself to track down the next big thing in the riding ranks. Firstly then, let me introduce you to some guys and a gal that could make you some money in the coming months. They are all apprentice or conditional jockeys, and my research is based on their mounts only when they're able to claim at least a three pounds allowance. That is, after all, a part of what makes them so sought after by trainers. Furthermore, I only focused on their rides priced at 20/1 or shorter, so as to minimize losing runs. They do ride bigger priced winners, but not on my watch. The not yet Famous Five then are Harry Bannister, Nico de Boinville, Lucy Gardner, Oisin Murphy and Jason Hart. The first trio are jump jockeys and the last pair are flat boys. Of the five, I think Oisin Murphy will become unprofitable to follow the quickest. The reason is simply that he's become a victim of his own success. 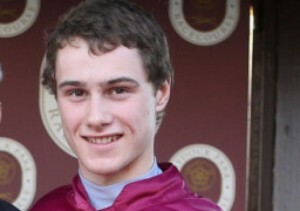 He's a brilliant young rider, who has ridden some high profile winners and that gets noticed. Jason Hart won the apprentice series on the flat last year, recording a 30.94 unit profit in the process, but seems to have still snuck under the radar to some degree. He actually managed to ride 51 winners from 369 rides (14%) last year, and he's already scored on six of his thirty mounts in 2014 for a profit of a massive 51 points! Of the jumps guys, Lucy Gardner rides very few horses outside of her mum Susan's squad, and she's actually never won on a horse trained by anyone else. But the Gardner's are a formidable team, and Lucy's one to keep onside. Nico de Boinville emerged from the Nicky Henderson stable a season or so ago, and has been riding winners galore since then. Although his main supply of rides - and winners - is guv'nor Hendo, he's also unsaddled in the winners' enclosure for a dozen other trainers in that time, and his services are much sought after. He's a strong and stylish rider and looks set for a bright future. The last name is perhaps the one with the most upside. Harry (H A A) Bannister is relatively unheralded, but his numbers lend credence to his emerging talent. Only eight winners into his National Hunt career (he's also ridden a couple of flat winners), Harry has spread that success across four different handlers with his boss, Charlie Mann, being the main beneficiary. Those eight NH winners have come from 59 rides, and were worth a profit of 9.25 points. But, as I say, he's the one I'm projecting forward with, rather than a more established star-in-the-making like some of the others. He's a higher risk proposition but with greater potential upside too. So how do you spot emerging talent for yourself? The answer is almost unnervingly simple, and lies primarily in the conditional and apprentice jockey tables each season. The key is to take a view fairly early in the season - say two to three months in - based on the data as it stands then. Another equally crude - and effective - method is to sort the Racing Post jockey stats by the profit column, and look for young riders with a reasonable number of rides under their belt. Then go through their form to make sure the profit isn't as a result of a single big-priced winner. An example that is on my 'to watch' list - not on the Next Gen Jockey list yet, but could soon graduate - is Charlie Deutsch (12 wins from his 74 rides, +75.66). His figures are skewed by a 100/1 winner, which is why he's on that watch list. But he's getting plenty of opportunities for Charlie Longsdon and the summer is a good time for young jumps jockeys to make a name for themselves. Callum Bewley and Dean Pratt (winner of the Scottish Champion Hurdle on Saturday aboard Cockney Sparrow) are also of interest when riding non-no-hopers (i.e. 20/1 or shorter). Meanwhile on the flat, Jenny Powell has started very brightly. She's an apprentice to Tom Dascombe and could come in for some fancied rides in the early weeks of the turf season. And Ali Rawlinson has been going well for boss, Mick Appleby. A database tool like horseracebase.com is also excellent for helping to filter the fancied runs from the no chance ones. I hope this short post has given you something to ponder and, at the very least, you now know my five 'next gen jocks' to follow. Let's hope they keep winning - and winning at prices - for many months to come. Oisin Murphy rode winners here in Australia recently some here say he’s a bright prospect. Good article I have jotted their names down, will follow with interest. Interesting piece – you don’t seem to mention the jockeys very often. I think it unnecessary to apologise to Trekkies. After all, they have only themselves to blame! I don’t mention jockeys very often because I think their role is generally overplayed. After all, we only need to look at the fact that McCoy chose NOT to ride the winners of the Champion and World Hurdles to know what good judges they are. And McCoy is one of the better judges usually! However, there is a clear logic to nominating up and comers. Firstly, they’re under the public betting radar to at least some degree; and secondly, the shrewdest trainers want to use these guys’ weight allowance on fancied horses in big handicaps. This is one of only two jockey angles I have, compared to over twenty trainer angles. p.s. I’ll say no more about Trekkies – they’re a very sensitive collective. And they have phasers!! I didn’t forget him. He’s an excellent young rider, and seems to be riding much better since coming out recently. Best of luck to him – he’s a very talented young man, but not quite as profitable as some others. thanks matt, followed 2 of the young jocks today and both obliged by winning. also i received an email today telling me about the draw bias at pontefract for stall 2, i blindly backed all the stall 2 horses for small stakes and ive had 3 winners and a second so a good day all round. sorry i made a mistake in my last post, only had 1 young jock winning, but still in good profit.